We released Sequential Discovery Burred Box yesterday. It is our last puzzle product to be released in 2018 and we are happy that we could have done that before Christmas. 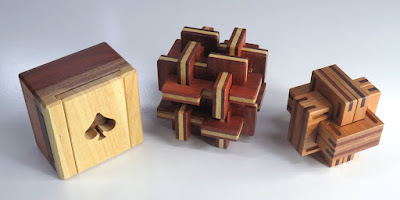 The puzzle looks like an ordinary six piece interlocking burr, but it is also a puzzle box and sequential discovery puzzle. 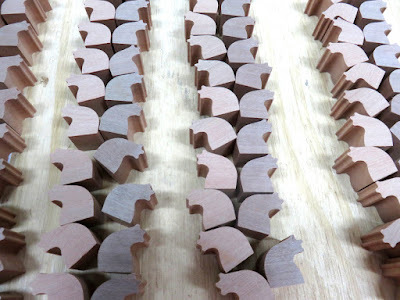 PNG Rosewood is used for the main part of the puzzle. 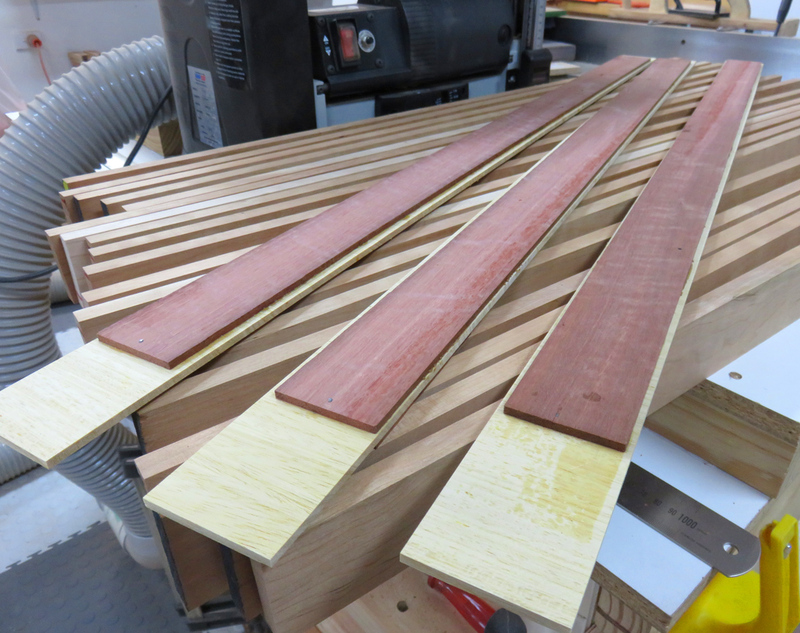 The color of the timber varies from pale yellow to reddish brown. Some have streaks, and some have obvious multiple colors in a timber piece. We randomly pick up the assembled puzzles when they are sold. We hope our customers like the color and texture of the puzzle. Juno wanted to produce more puzzles because it seems that there are big demands for puzzle box products, but during the complex production process, he lost roughly 15% of them. We put less than 70 of them on our shopping website, and thanks to our customers' support, more than two thirds were sold within 24 hours after the puzzle had been released. It is big surprise to us. We are able to enjoy a happy Christmas time. 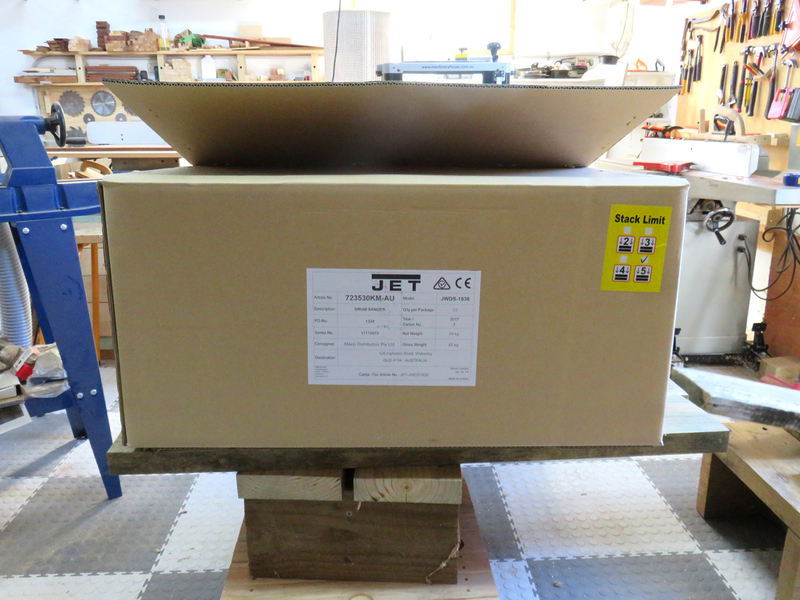 The size of the puzzle is 101 mm x 101 mm x 101 mm. You might feel it is a bit chunky because the mass volume of the puzzle is three to four times bigger than the ordinary size six piece burr puzzles. It was necessary to have such a big size to contain a weird gimmick or mechanism in the puzzle. 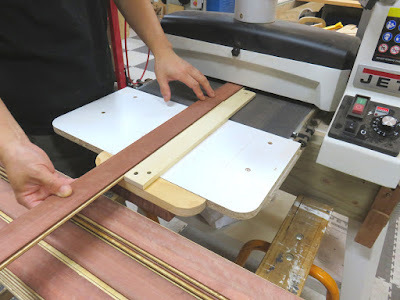 We already have been working on our next puzzle products. The next puzzle would be a little different than what we have produced. It has a concrete and representational shape. I would like to say what shape it would be, I really would, but sorry this is a top secret now. At least, I can say lots of people would love it! I'm unsure but the release of the next puzzle will be next year. Please look forward to it! We wish we could produce more puzzles in 2019 and make you feel wow! and aha! We hope your Holiday Season is fun with lots of puzzles, and full of sparkles! The auction we had held ended on 4th Nov. The total sales amount was AUD $289.82. For donating half the amount of sales, we went to the Animal Welfare League QLD and met fluffy friends. 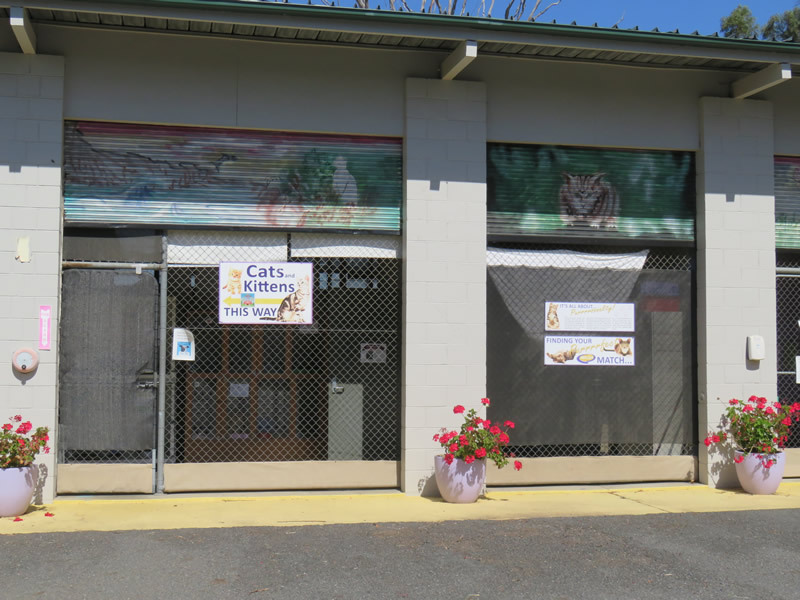 Here is the receipt from Animal Welfare. If we have got any 2nd grade puzzles or if I make mini-puzzles, we will hold an eBay auction someday again. The eBay puzzle auction has finished successfully and next is the time to start selling our new puzzle, the "Great Grate Puzzle." A second grade Great Grate Puzzle was on the auction, so some of the readers might have seen pictures of it. 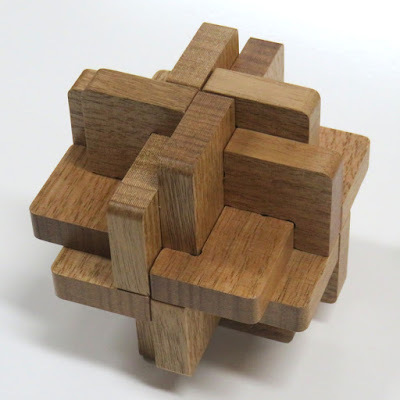 This is a puzzle that requires 32 moves to take the first piece apart from the assembled shape. 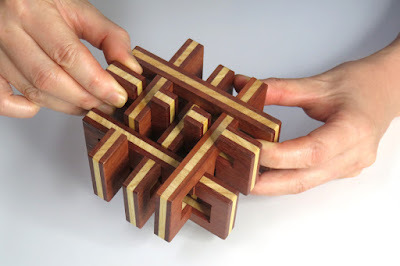 There are only 32 possible assemblies for the puzzle and only one among them can be assembled. 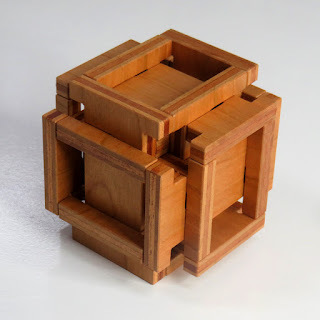 It looks a simple design, but I'm sure it is difficult to solve. 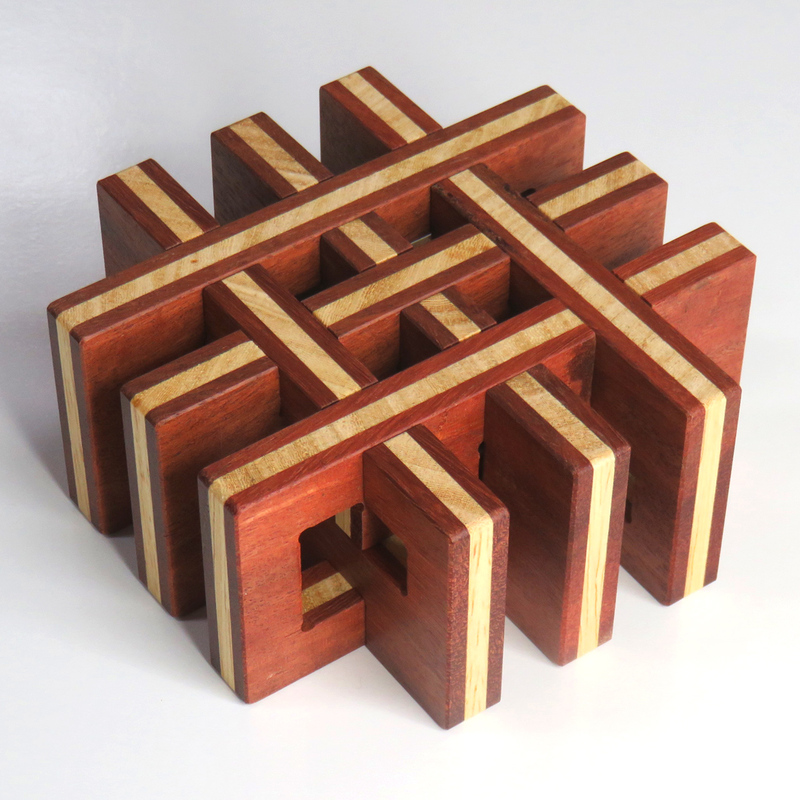 This puzzle was made from laminated plywood pieces. The number of puzzles is not many. This is a type of puzzle I like. I like puzzles in which all the mechanism can be seen. I can scrutinize all the notches and it makes me think that it can be solved. In fact, most of the time what I thought that I was able to solve is a fantasy. Every time I grumble and mutter to myself, " What's this? ", "What's wrong? ", "Oops!" If I say, "Aha!" 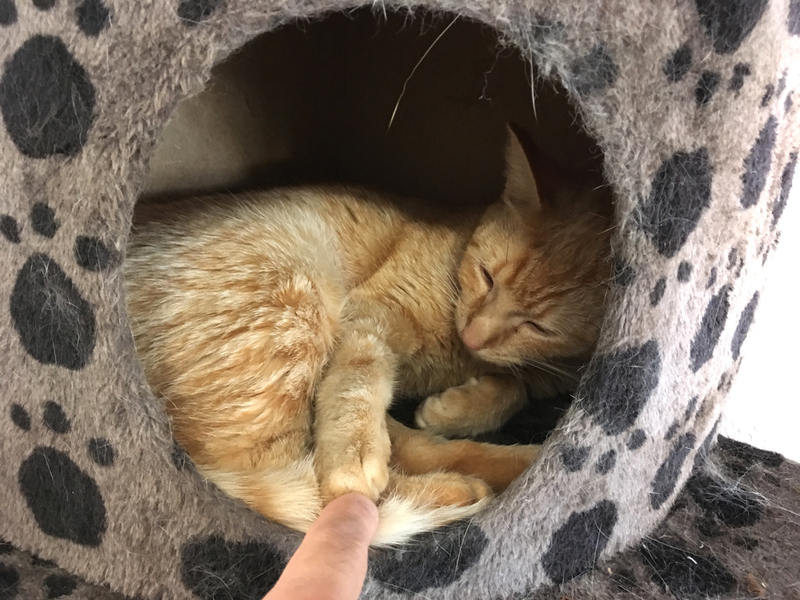 while I am playing, it is a high possibility to be solved. I hope you enjoy playing with the Great Grate Puzzle. If you are a regular reader of this blog, maybe you are thinking that it is about time that the next puzzle auction started. Yes, you are right! We have put four kinds of puzzles, in total five puzzles, up for auction on eBay! This time, there is one puzzle that has never been produced before and I think this is a big opportunity to get it. We are going to donate half of the sold amount of this auction to The Animal Welfare League Queensland as we have always done. The great Grate Puzzle puzzle which is second grade will be selling after the auction on our online shop. 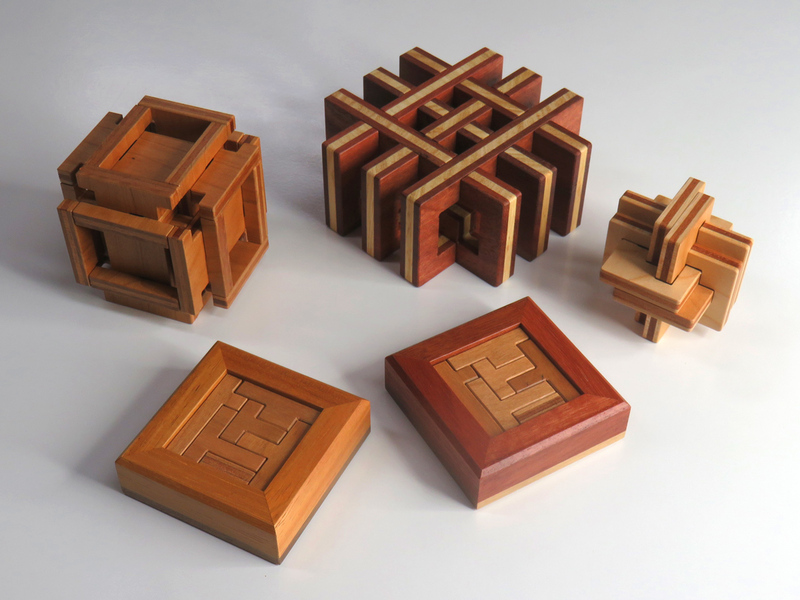 Four puzzles are small puzzles that were made by me (Yukari). Juno designed this packing puzzle in 1990. The puzzle consists of all 16 T-shaped pieces that have four to seven cubic volumes. 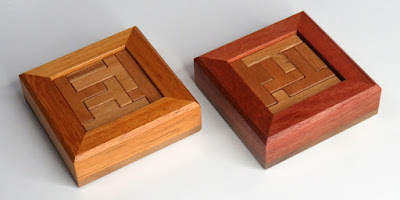 He produced only two or three of these puzzles in the past as his woodworking hobby. The packed puzzle pieces make two layers in the box, a 6 x 6 square for the upper layer and an 8 x 8 square for the lower layer. 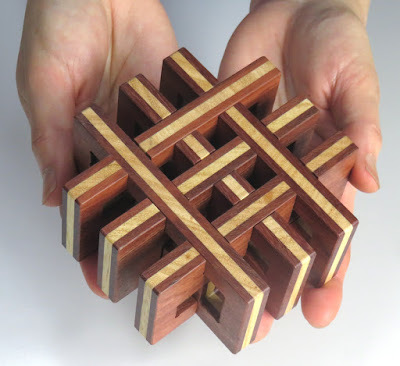 The puzzle was designed in 2007 and it has never been produced because no one except Juno himself knew the puzzle. He neither did open the puzzle design to the public. So, this is the first time the puzzle has been sold. The puzzle has a unique level 5-11-4-3-3 solution. 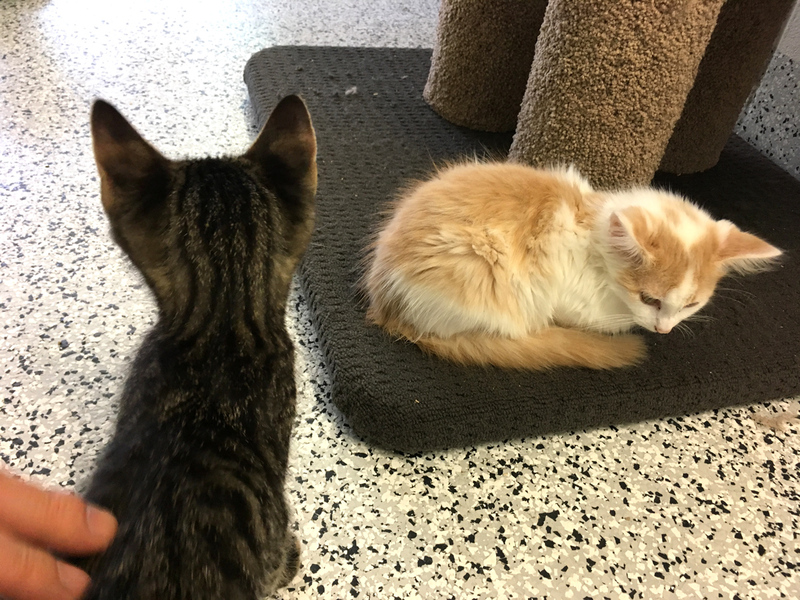 One day, Juno realized there were leftovers of reasonable size of plywood. 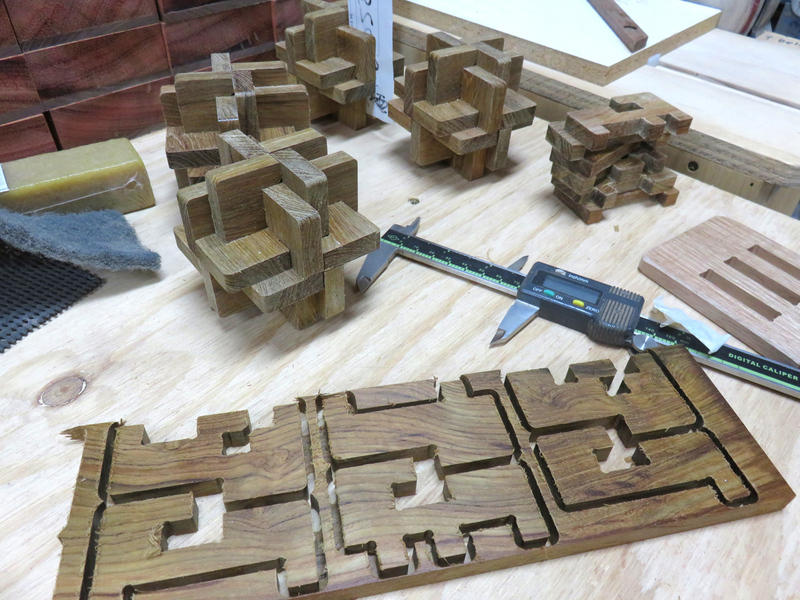 He designed this puzzle so the pieces fit in those remaining plywood. 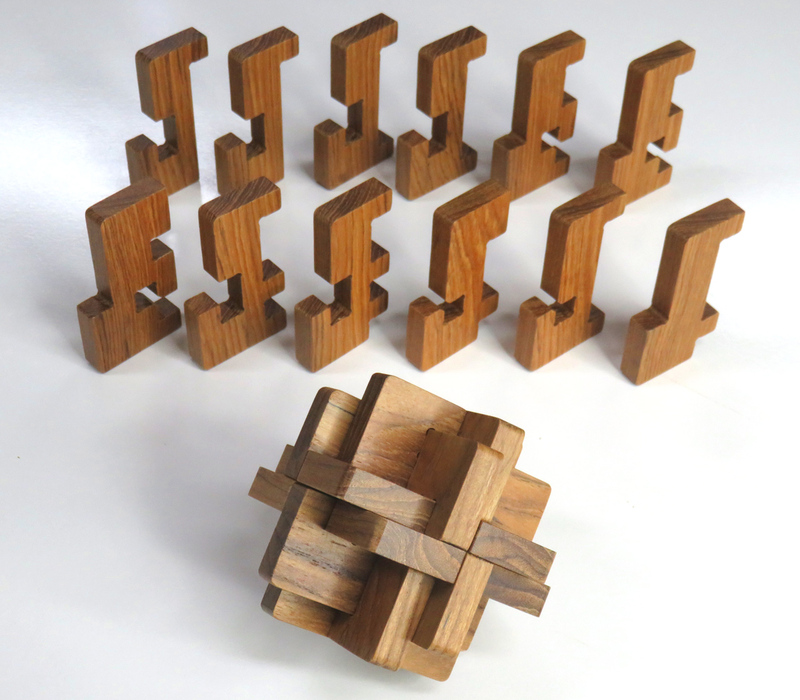 This 12-piece board burr puzzle has 1104 solutions, and all of these require 8 moves to take the first piece apart from the assembled shape. The same as 6 Board Burr 5x8 #1, this is the first time the puzzle has become public and is being sold. After the auction, we are going to release this board burr puzzle at a retail price of AU $96.00. Because this particular one has several marks of mending, we don't want to sell it as our regular product and decided to put it on auction. The puzzle has a very complex level 32-6-7-3-4 unique solution. 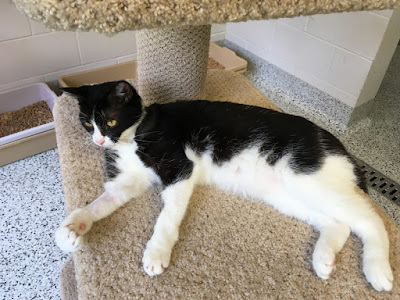 We are waiting for you to join the eBay auction! It's been a while since the last time we have released puzzles. 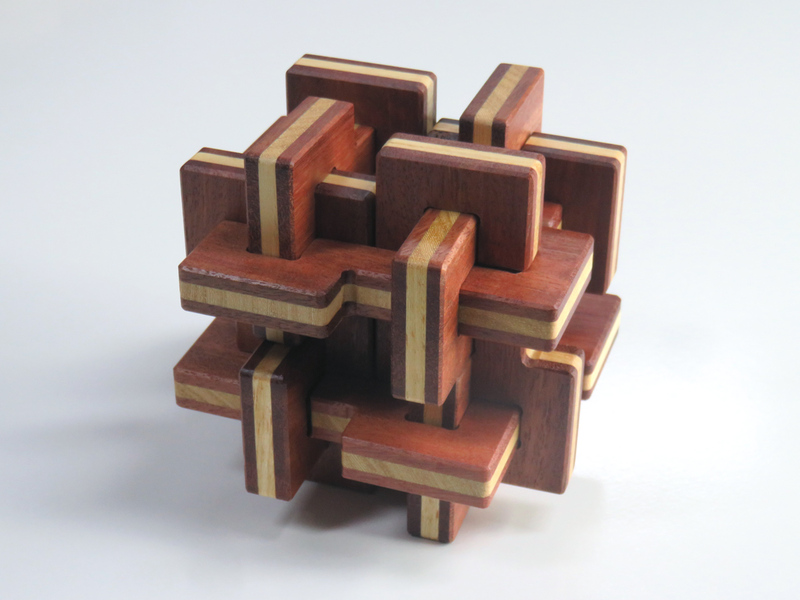 We have started selling following three new puzzles! 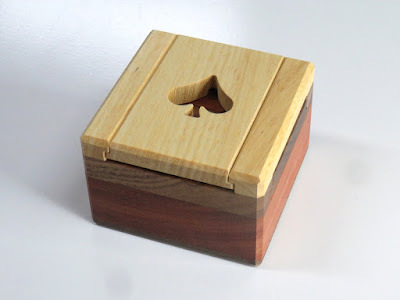 Spade Case is the last one of our trump card series puzzle boxes. Each of three former puzzle boxes, Diamond Case, Club Case and Heart Case has a unique mechanism to open. Spade Case is not an exception. We believe that many puzzle box collectors would say, "I have never seen this kind of trick." Grooved 6 Board Burr #1 requires 22 moves to take the first piece apart from the assembled shape. As you see on the image, there are several grooves on the surface of the puzzle pieces. 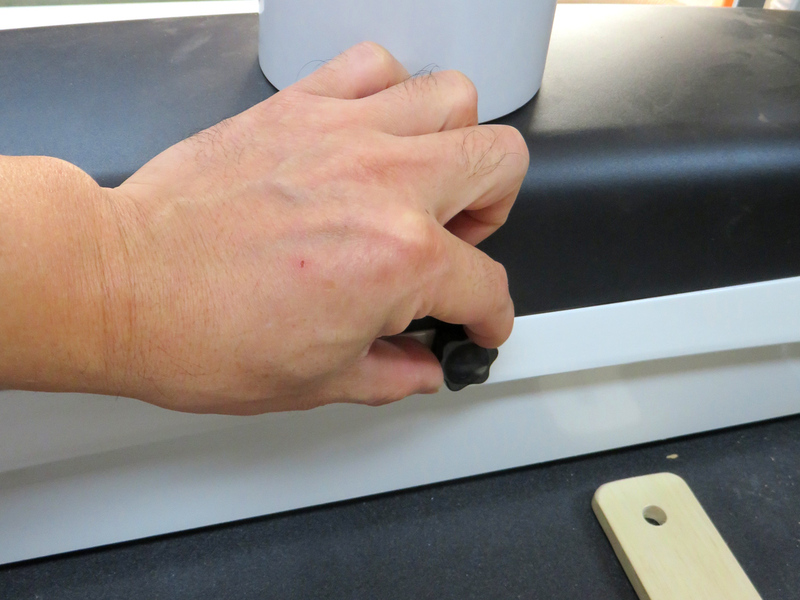 The internal hidden pin travels along the grooves and this feature restricts the movement of the pieces. Sometimes when you disassemble the puzzle, you might think that the first piece almost comes apart. 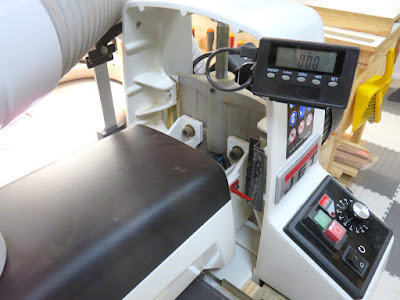 Then you notice that it is still on the half way of the disassembling process. 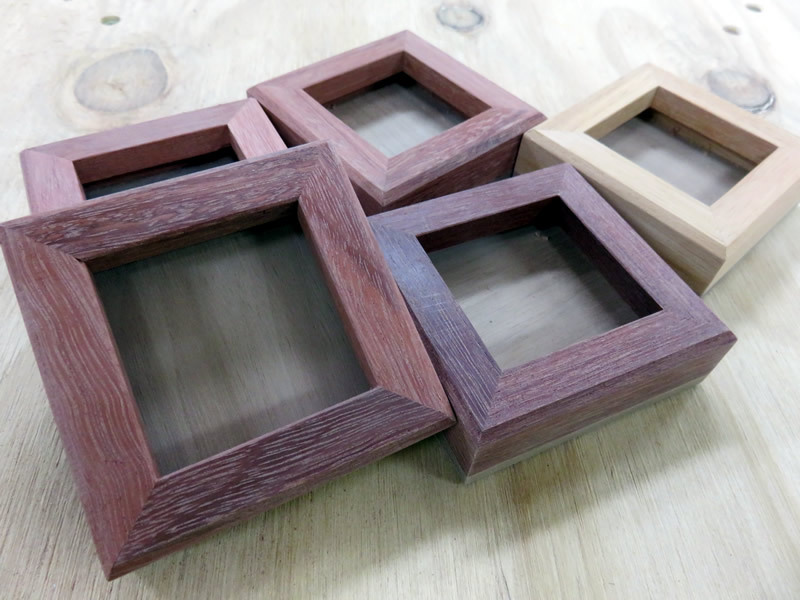 The ends of each piece are reinforced by the darker timber Jarrah to gives strength and good contrast. 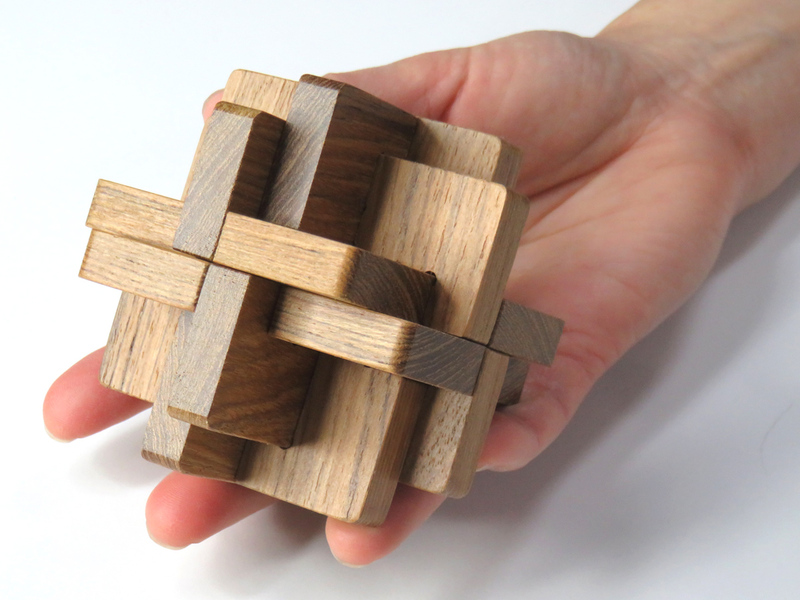 Tangled Clip Burr is a very solid and heavy 12-piece board burr puzzle. 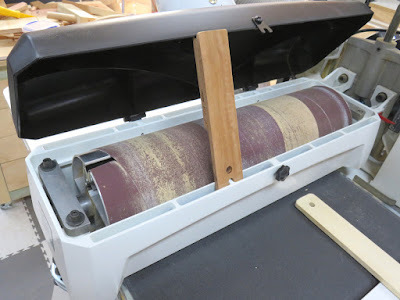 To produce very complex puzzle pieces with tough durability, Juno laminated three layers of thin timbers crossing the grains at a right angle. This is an extremely difficult puzzle and I think most human beings cannot assemble the puzzle without any clue or computer aids. Once the puzzle is assembled, it really stands out by the higher symmetry and colors of the laminated timbers. Hope you will love our puzzles! The puzzle auction we had held was ended on 6th September successfully. We had put in 5 puzzles, including 3 mini puzzles. 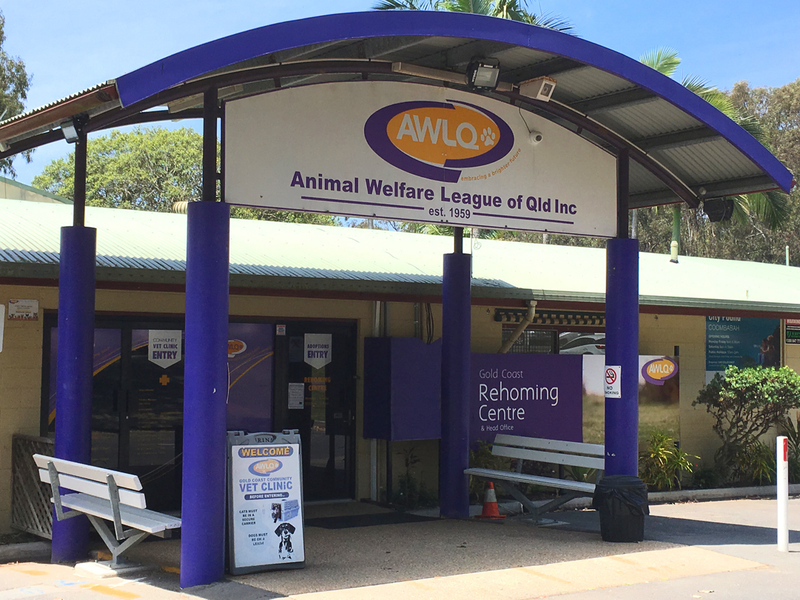 As we promised, we donated half the sales amount to the local animal shelter, AWLQ today. Here's some pictures we had taken at the AWLQ. 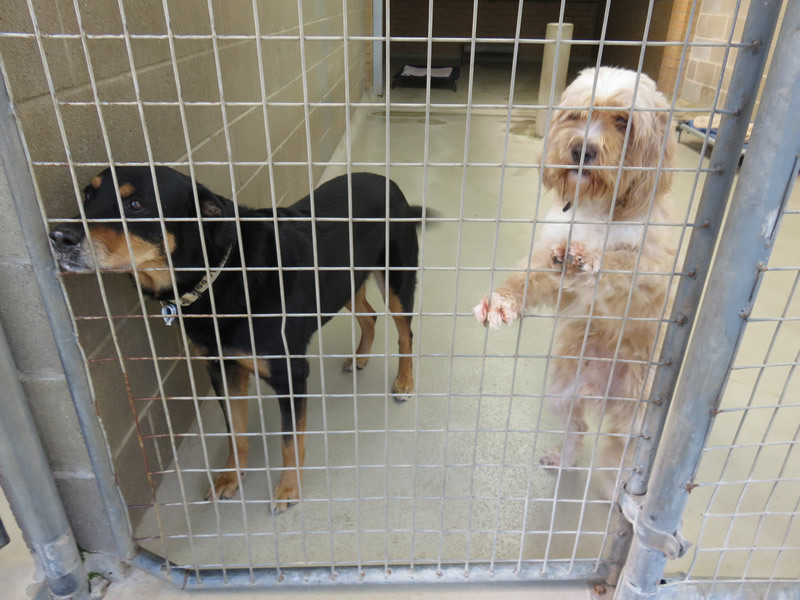 The donated money will be used for these cats and dogs' food and treatment cost. I'm completely pleased with the results this time and have begun to make new mini puzzles. It's a little early to tell, but I'm making mini puzzles including new puzzles that we haven't sold before. 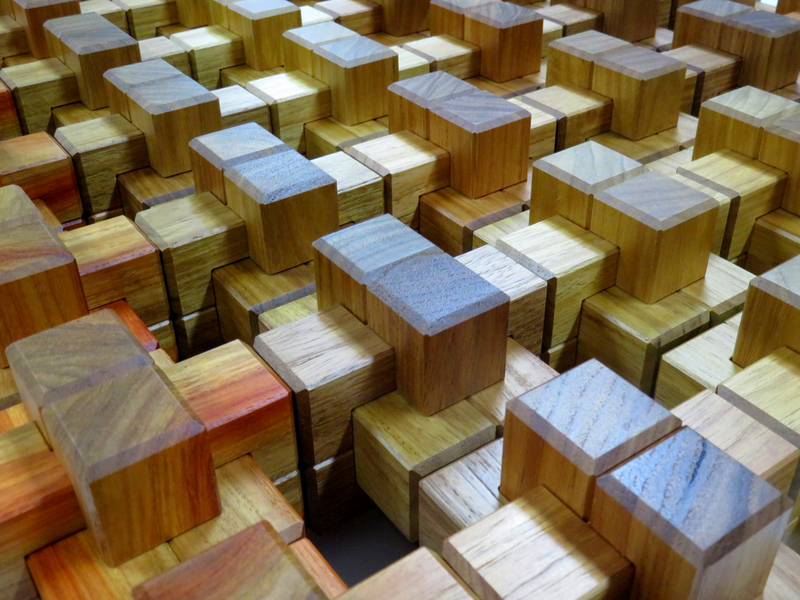 These are pictures of puzzles in production now. Can you guess what types of puzzle they are? Please look forward to the next auction! 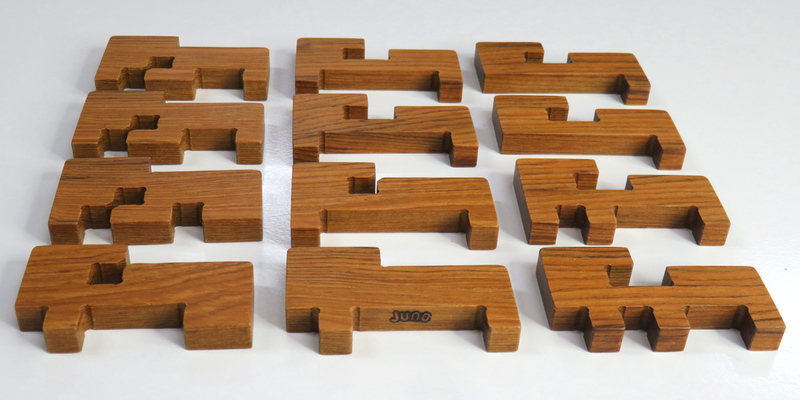 We have put five puzzles up for auction on eBay! Every puzzle starts from $1.00 AUD! 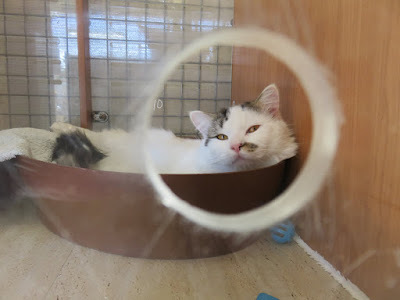 Please have a look at the Pluredro eBay shop and join the auctions. 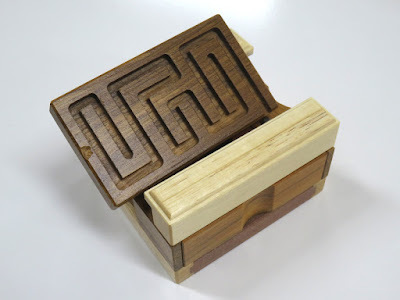 This is a 172 steps version of Meanders Box. 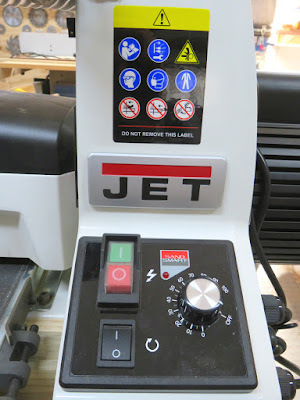 As you see on the image, there is an obvious chipout on the grooved lid. There is also a hairline crack on one of the upper white rail piece. The puzzle has no problem to play with but we don't want sell the puzzle as our regular product. 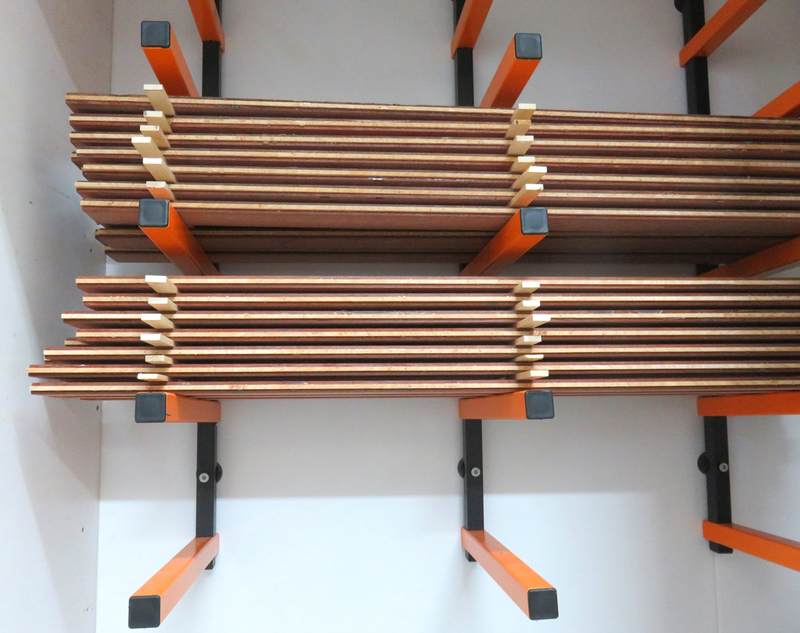 Juno made the test version of 3D Shuriken using Utile timber before the production of the regular Burmese Teak version. 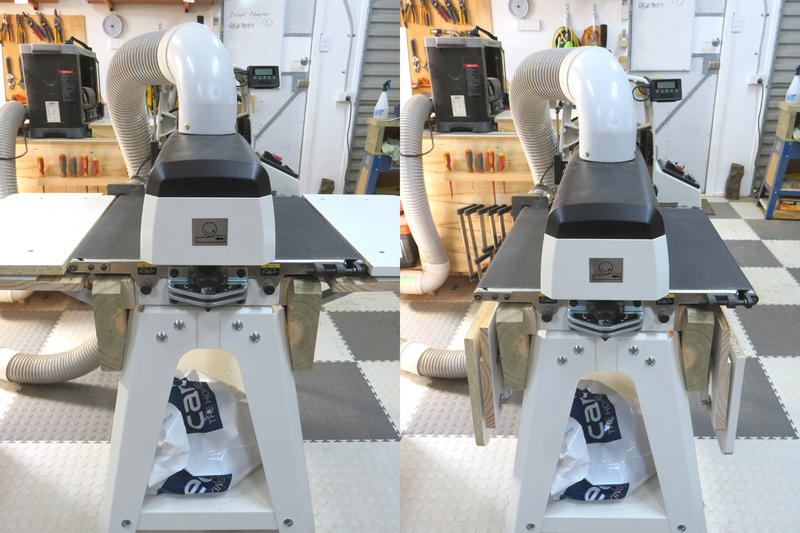 The puzzle has a bit of a loose fitting compared to the regular version and sanding and arrising are also plain. 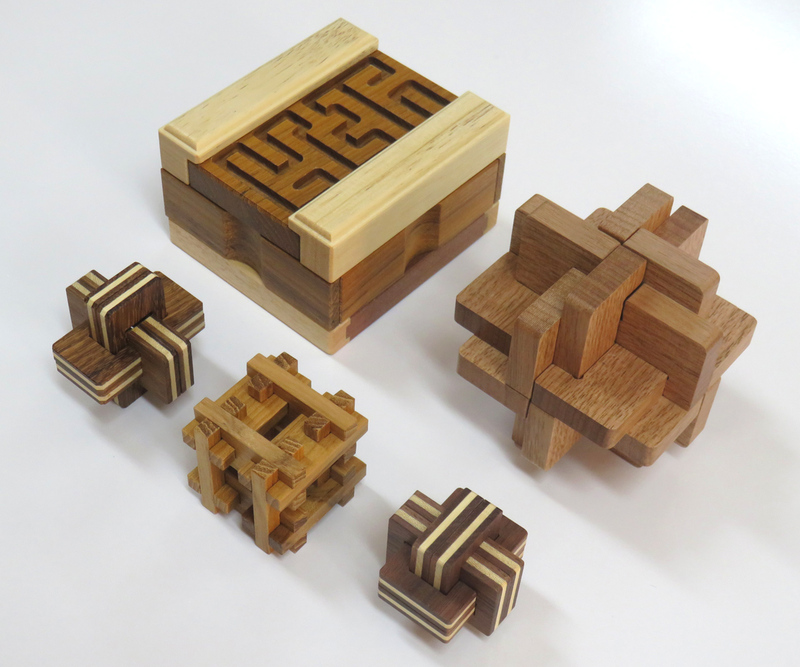 The following three miniature puzzles are made by Yukari, one of the owner of Pluredro Shop. Please also have a look at her blog entry about the miniature puzzle. The puzzle is made by Yukari. 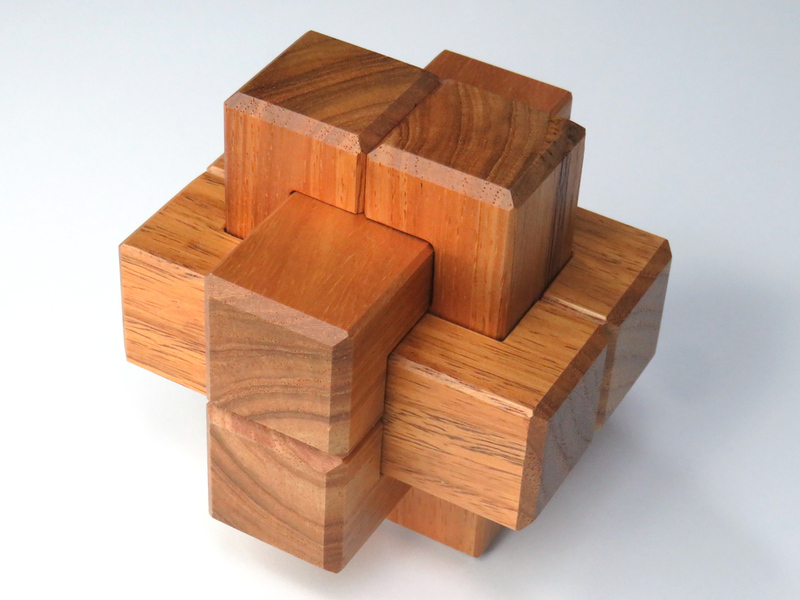 Solid Burmese Teak is used for the puzzle. 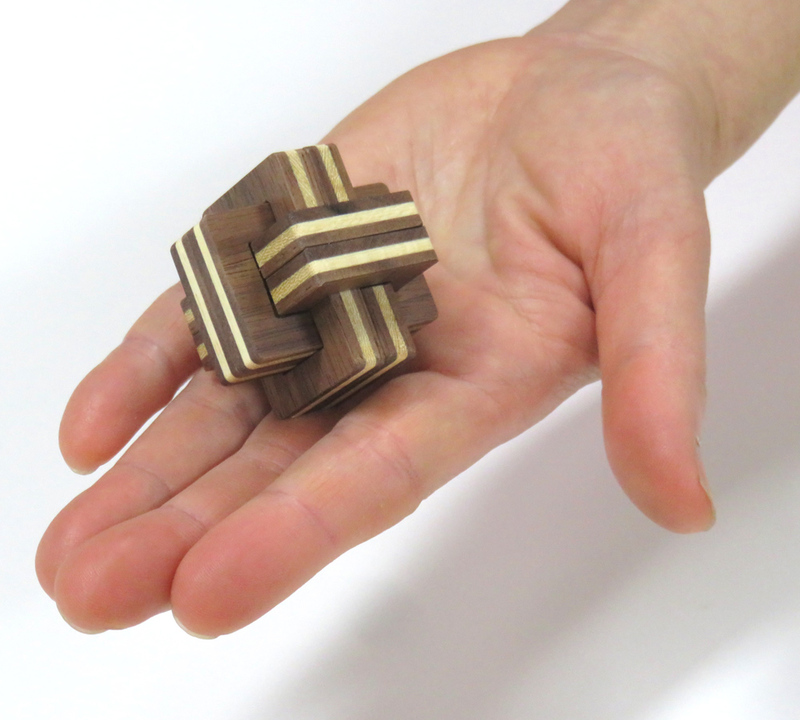 Plywood of American Black Walnut and Koto is used for the puzzle. 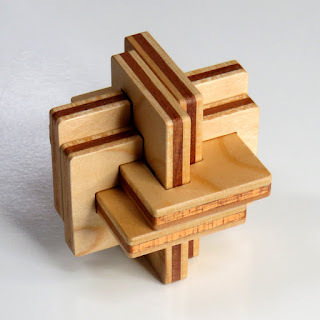 This classic puzzle designed in 1990 has a slanted checkout and the solution is a bit unusual. 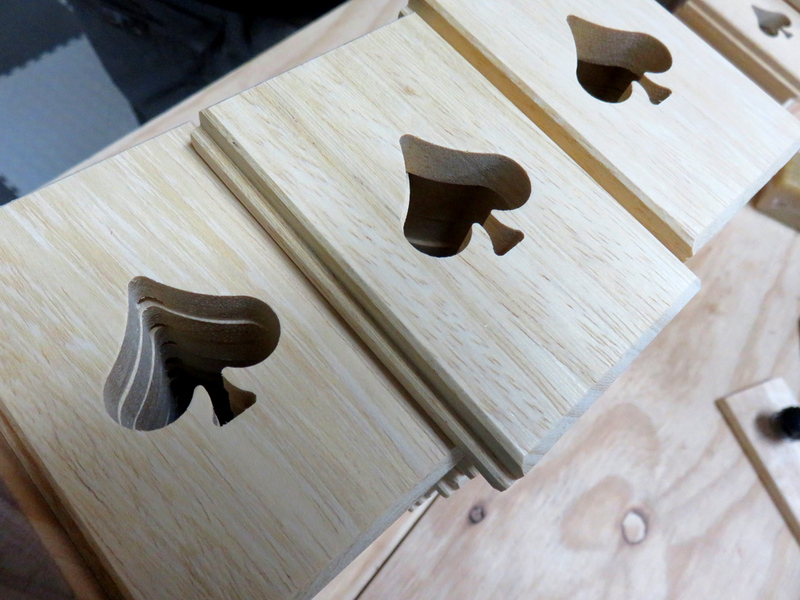 Plywood of Blackbean and Sliverash is used for the puzzle. 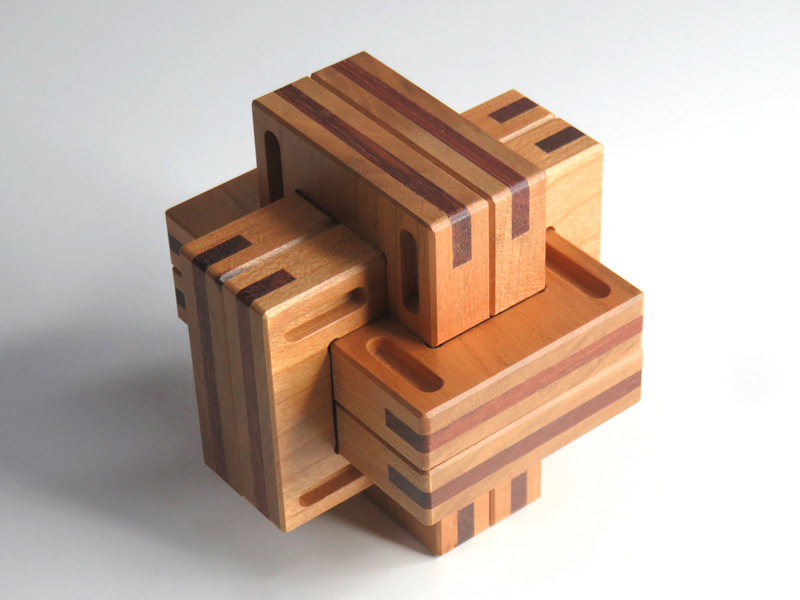 The larger version of this puzzle was exchanged at the 16th International Puzzle Party held in Luxembourg in 1996. The above puzzles, H Burr, 6 Board Burr #1 and 6 Board Burr #2 that I (Yukari) made are small but can be played with. 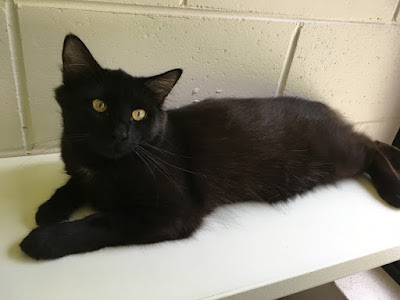 As serious cat lovers, we are going to donate half of the sold amount of this auction to The Animal Welfare League Queensland. They also support stranded dogs, houses and other small animals as well, so we also welcome all animal lovers to attend the auction. 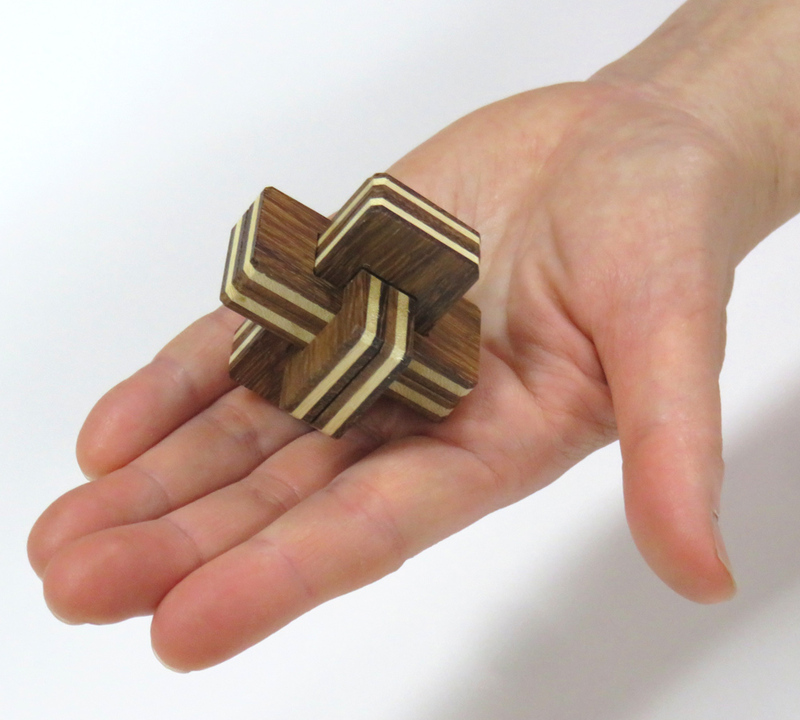 We have released a very difficult interlocking burr puzzle, 3D Shuriken. Shuriken is a kind of weapon also called a Ninja star. There are various types of shurikens that have symmetrical and flat shapes. Juno designed the puzzle preserving its highly symmetrical shape and he made it three dimensional, so he named the puzzle as 3D Shuriken. 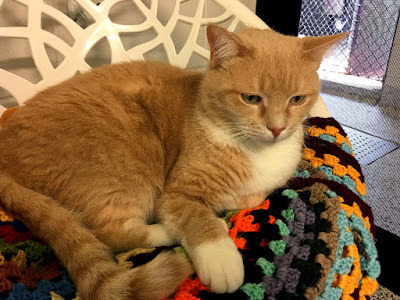 It is a very difficult puzzle and Juno says that it is almost impossible for human beings to assemble the puzzle if the puzzle pieces are handed disassembled and you have no preliminary clue about the orientation of the pieces. 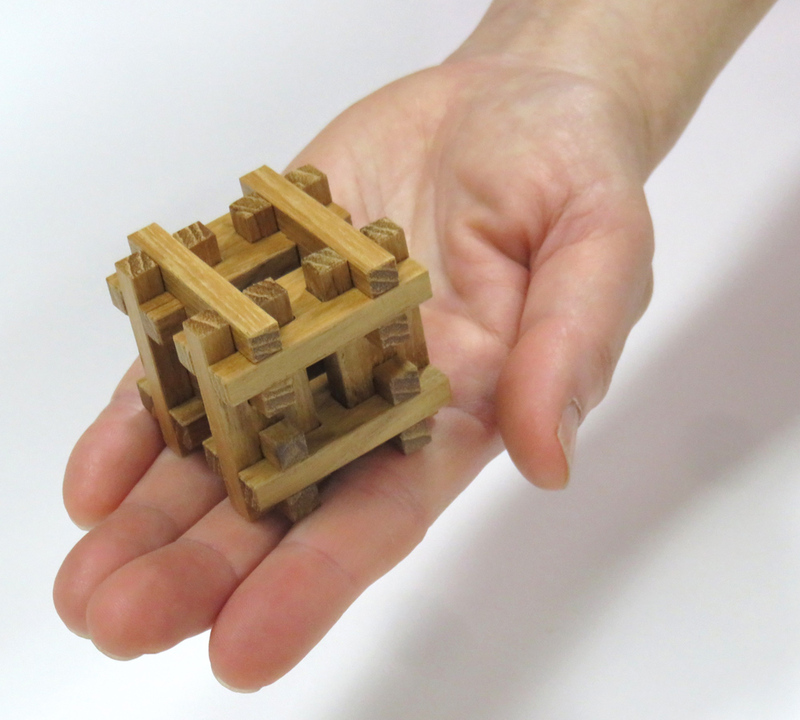 There are a possible 297 assemblies to the puzzle but only one can be assembled in three-dimensional space. The timber used for the puzzle is Burmese Teak sold as "second grade" because there are lots of knots on the surface and the grains are very woven. 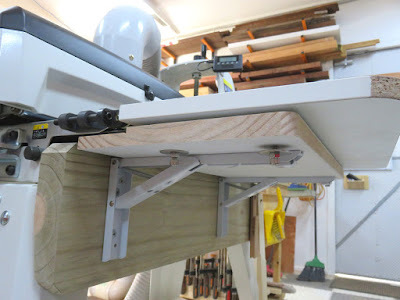 These kinds of timber are not popular for boat builders because they don't want knots, but we could avoid dead knots when we cut the pieces and also Juno really likes the character of the timber. 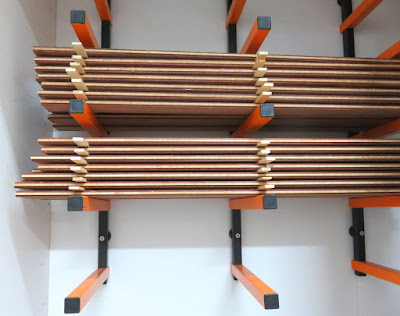 We had a win-win situation with a Teak lumber dealer and happily bought this gorgeous and precious timber. Juno made a test version of the puzzle during the production and we are planning to put it on eBay auction in early September. 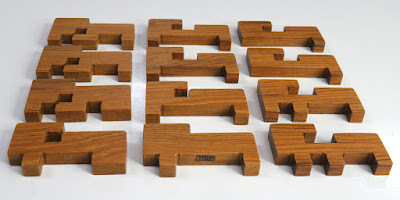 A few of my miniature puzzles would be put on auction as well, so if you buy something else together, the shipping cost of the miniature puzzle is free because the puzzle has almost no weight and it can be combined for shipping without extra charge. 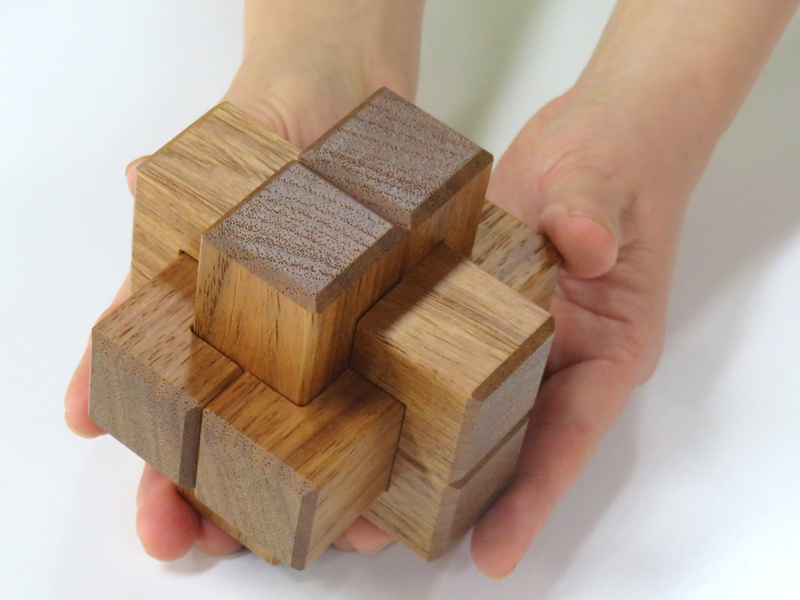 If you would like to get and enjoy the puzzle very soon, yep, they are available at our online shop.